I had been testing out two different versions of one of our web pages, and I wanted to know which one was making more sales. When I looked at the statistics though, I was completely surprised to find out something far more important than that -- most people weren't even reading my page! And then it hit me: All this time I had been fiddling around with what I was putting on my web page, but I hadn't even considered the possibility that people weren't even reading it. As you can see, I gathered data on 35,813 visits, so the information here is prety accurate. The average amount of time that people spent on my site was less than 5 minutes, and 71% of my visitors "bounced" (left my site without clicking on anything). Isn't that disappointing? I know I was disappointed! But at the same time, I was excited, because I felt like I had found a big clue as to why people weren't purchasing from my site. This new data made the "5 minute" look good! Really, over 75% of my visitors were spending 10 seconds or less on my page. After spending a few days doing in-depth research on Google, I discovered that this is in fact better than most people do, too! I realized at this point that if I wanted to really boost my sales, it didn't really matter what I put on my web page, since most people weren't even reading it. I could have paid $100,000 to have the world's best marketing consultant write a beautiful sales letter, but most of my visitors wouldn't even have seen it. I spent a long time trying to figure out what to do about this. Ten seconds isn't even long enough for people to read just one sentence and process it enough to know if I have something they want to buy. I thought about trying to get some really bizarre and attention-grabbing images and animations, but I knew that this was a desperate, gimmicky last resort and it didn't feel right. Not too long ago, there actually was a solution to this problem, called the "exit popup." You've probably seen these before, but there really aren't much of them anymore, because they worked too well! Nowadays, all major web browsers come with a feature built in to them which automatically detects "exit popups" (and other kinds of popups) and blocks them before you see them. Most people think that this is because they were simply too annoying. That may be true, but that's not why everyone blocks them. When I tell this to people, they usually tell me that there's no way that exit popups worked, because they were so annoying. But, this doesn't help me or you, because due to consumer demand, exit popups have been removed from the game completely! We threw it up on one of our web sites and immediately experienced a 327% boost in sales, practically over night. We dubbed it the Exit Grabber, because that's exactly what it does -- it grabs your visitors back right before they exit your web site, and it gets them to buy. In less than 30 seconds, you download our quick and easy Exit Grabber software to your computer, which will allow you to generate an unlimited number of "exit grabbers" that you can put on your web sites. In another 30 seconds, you create an "exit grabber" using our software, and place it on your website (requires no programming experience). From that point forward, the exit grabber will sit on your website and analyze your visitors' browsing behavior using intelligent software to predict when they are about to leave your website (not as they leave, but right when they are thinking about it). Your "exit grabber" will catch everyone who leaves your site without buying, but will not be displayed to anyone who stays on your site. So, you'll be able to show something to everyone who wasn't going to buy anyway, without disturbing the people who are going to. Since the exit grabber is not a popup, if the visitors definitely wants to continue away and leave the site, they don't even have to close it. It closes itself when people leave for good! So, they aren't annoying at all. The first thing that I want to stress is that exit grabbers are not popups. Popups have been "out of the game" for a long time now, since all major browsers block them automatically. If you understand a little about web programming, you're probably familiar with the fact that browsers are able to block exit popups by simply preventing your website from doing anything once the visitors chooses to leave it. The visitor's attention will be grabbed by this, and you can use the opportunity to give them an enticing special offer, or get them to subscribe to your list, or to do whatever you want! All we can say here is that it analyzes your visitors' behavior intelligently, and that it works very well. And, because of the way we've written Exit Grabber, they can never be blocked by anyone's browser, since it is technically impossible to block this type of program (unlike popups). Try It On This Page! Want to see an Exit Grabber in action? Go ahead, move your mouse up to the "back" button, or try to enter a new URL into your browser right now to leave this site. Our testing has shown that grabbing people's attention right when they are about to leave your page works like crazy, especially because they aren't expecting it. Give them a special offer - Your visitors were about to leave your site, but right at that moment you make them an offer they can't refuse (maybe a discounted price, or an added bonus if they order now, for instance). The excitement of not expecting to get something like that right at that moment can have explosive results, and draw people right back into your website. Get them to subscribe to your newsletter - Most of your visitors probably are interested in what you have to say, since they did visit your site initially. They may not have time to read your site now, but they likely will subscribe to your newsletter on the way out. Many times, getting a newsletter subscriber can be more valuable than a new sale, and this is one of the most poweful ways ot do it. Offer them a free download - Most people will take you up on a free download on the way out, even if they were too busy to read the rest of your site. You can then collect their email address, and follow up with them later, or use your free download to promote what you're selling. Ask them why they are leaving - Maybe there's a reason why people are leaving your site without buying. You can put a survey in your exit grabber to find out exactly why people are leaving your site. The beauty of this is it will only ask the people who leave without buying, and it will ask all the people who leave without buying, so you'll get the full picture. Link to your other sites - Maybe your visitors didn't find what they wanted on your site just now, but they may be very interested in other sites that you have. They're leaving to go to another site -- so catch them, and recommend another one of yours! Audio, Video, Flash, and the works - You can put anything in your exit grabber that you can put on a regular web page. So, you can easily show your visitors a video, or play them an audio file, right as they're thinking about leaving. This can really multiply your sales rates. Much more - It's completely up to you what you want to put inside your exit grabber. So, the sky's the limit -- we just provide the tool to make it all happen. Exit Grabber Is Extremely Easy To Use And You'll Be Up And Running In Seconds! When you order Exit Grabber, you'll immediately be able to download our quick and easy-to-use software program to your computer. It will instantly allow you to make an unlimited number of "exit grabbers" which you can put on as many web sites as you want. I spent a long time consulting with my business partners and thinking about it hard before I decided what price to sell ExitGrabber for. What I realized is this -- of course, it's not as if putting an "exit grabber" up on your website is going to make every single visitor buy from your site. On the other hand, what if it just causes one more visitor out of 100 to buy your product (a conservative estimate, mind you, based on my testing)? Well, if your web page was previously converting 2% of its visitors into buyers (that's 2 out of 100), then now it's converting 3 out of 100, or 3%. That is a 150% increase overall, meaning that if you were going to make $100,000 in a year, now you're going to make $150,000. That's a $50,000 profit from just taking a few minues to add an exit grabber to your site. Not bad. And, of course, if your website wasn't converting any visitors at all into sales, then the increase in profit you'll see will be even more dramatic! Because it's so powerful, pretty much everone agrees with me that I could easily charge $200 or $300 for this product and have no problem making sales. More than that would probably work. These days, however, I've been in the mood to test out selling my products cheaper than I should to see what happens. So, right now I'm selling ExitGrabber for only $79.95, to measure the effects of using a price cheaper than I should. Mind you, I already increased the price from $49.95 not too long ago because I knew I could raise the price and still make the same number of sales, and I was right. I'm not going to over-hype you and tell you that if you don't buy in the next 5 seconds then the price will go up again, but instead I'll just be honest with you and tell you that I will raise the price soon, because this is only a temporary price test. I know that you're probably very excited to let Exit Grabber grab your rightful visitors back and boost your sales like crazy. After all, it's one thing to read about my success, but the real proof is going to come when you use it for yourself. That's why I've decided to offer a 60-day no-questions-asked 100% money-back guarantee for my Exit Grabber software. What this means for you is you can order and download our software, and make as many "exit grabbers" as you want for two months to see how they work for you. If you aren't totally blown away by how much they boost your sales and the effectiveness of your website, just let us know and we'll give you a refund instantly. I realize that this policy is a little bit too generous, and that people are going to abuse it by buying our software, adding exit grabbers to their website, and then asking for a refund. Of course I can't ensure that this doesn't happen, but I am still offering this guarantee because I know that the most people are honest, and want a chance to put software to a real test before they decide to keep it. The bottom line is, for whatever reason, if you want your money back for up to 60 days you can get it with absolutely no hassle. Click the button below to order now and see for yourself. 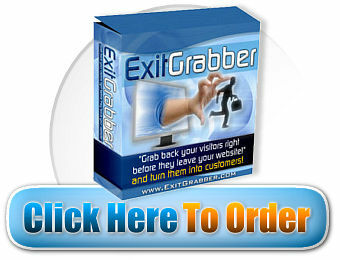 As soon as you order, you will be able to download Exit Grabber instantly! P.S. If you order now, I have a huge limited-time-only bonus available for you. But, I am going to take it off soon -- just a warning. I don't even want to say what it is on the main page...You'll find out why when you see what it is!